*Himpathy: the inappropriate and disproportionate sympathy that powerful men often enjoy in cases of sexual assault, intimate partner violence, homicide and other misogynistic behavior. 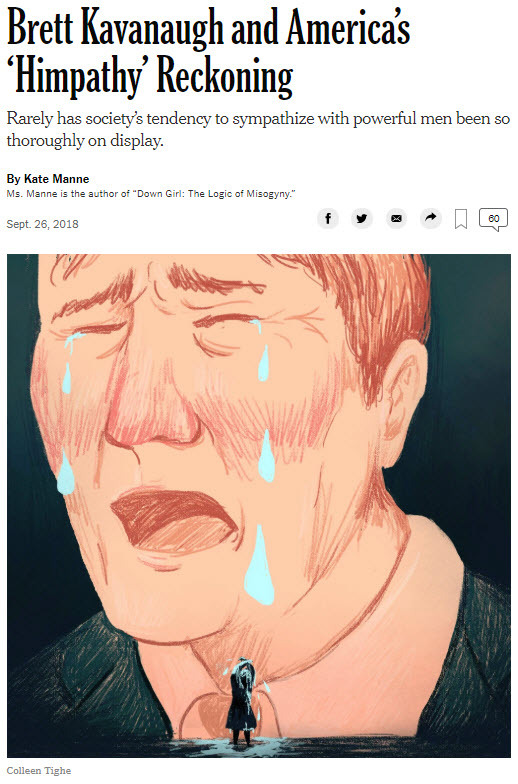 Kate Manne uses the word in an opinion piece in the NYT. Thursday morning, all eyes will be on the hearing of Dr Christine Blasey Ford’s testimony and (Supreme Court nominee) Judge Kavanaugh’s testimony, before the Senate Judiciary Committee in Washington DC. A new word for my dictionary. Right on! And I have very little himpathy for Judge Kavanaugh after watching today’s hearings.